I have come back from Spain, to be completely snowed in with work, emails and disappointment from external factors within one aspect of my business. Therefore, due to the overwhelming amount of bombardment, I will be keeping this short. On a positive note, my time in Spain was very good and productive. I have finalized everything, including every color way that each model will come in. Hopefully these samples will all be done by September, which will allow me to crack on with getting them on your feet. Thanks to all those still eagerly awaiting them! As far as replying to emails, I will do my best to sort them all out before next week. And for the shoe polishing contest, I will put up the pictures of the contestants that participated in due time. However, this will be the last contest for a while, as there was not even 10 submissions. 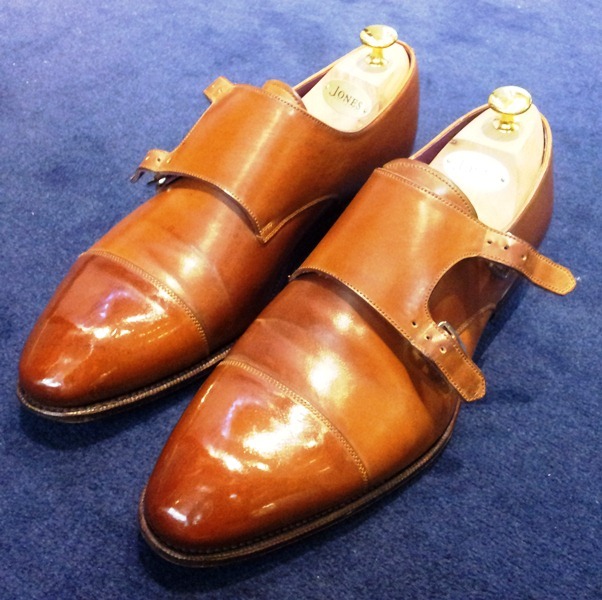 On another note, here are a pair of tan cordovan Carmina monk straps that I shined a few weeks back. They were among the loveliest classic shoes that I have come across and it was truly a pleasure to shine them. While I can’t say that I am the craziest about cordovan leather, due to it’s stiffness, I can say that the more that I am exposed to it, the more inclined I am to seek a pair out. I will divulge a bit more on my time in Spain on my Monday post and I will have a longer shoe post tomorrow for the Shoes Of The Week entry. Thanks for your understanding of my lack of time today.